What do you imagine when you think of “the wild?” Animal instincts? A beautiful symbiosis of life and death where animals kill to eat? It’s phenomenal how breathtaking the wild can be, even when a shark is about to devour a bird. Many of us may think of a jungle as having ferocious animals doing what they need to do to survive, ruthless. But do you picture a monkey taking in a different species as a friend, caring for a cat in the middle of the jungle? Believe it! These photos show an absolutely adorable relationship. A young, long-tailed macaque monkey has been spotted cradling a ginger kitten in an Indonesian forest. Amateur wildlife photographer, Anne Young, was visiting the Monkey Forest Park in the Ubud region of Bali when she stumbled upon these two. Can you imagine walking up to this sight in person? The little ginger cat must be pretty popular among those monkeys. Here they are, just chillin’ together. 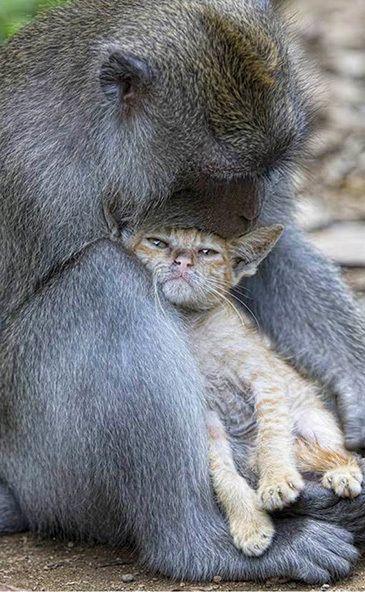 Looks like this monkey has become the official protector of this cat, cradling him as if he were a baby. We would not dare to give them any trouble! How sweet it is to see this inter-species relationship, where a monkey still recognizes a different being as sentient one. Macaques are the most widespread genus of primate on the planet besides humans. When you look at these photos, it’s easy to see the similarities between our species. We both want companionship and to care for others. We find friendship in the most unlikely beings. We fall in love without plan, and we can set aside those animal instincts to just sit back, relax and savor what’s really important. Us humans can learn a lot from this (like the importance of caring for all living things equally), and we hope these two continue to be very good friends!